Woot is currently selling the K20D refurbished with an 18-55mm lens for $499 + $5 shipping. With new old stock available and a lot of used camera bodies around. Now seems to be the time to pick up an older camera body that still is a very solid camera. Technically it’s selling through “Moofi” which is some other gimmick from Woot. I don’t image the deal will last more than a few days. 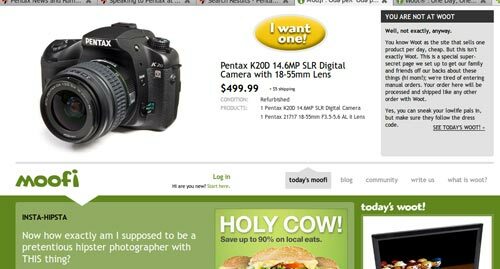 This entry was posted in News and tagged online, pentax, refurbished, sales, woot. Bookmark the permalink.